Washington, D.C.. Publisher: Oriental Esoteric Center; and after mid-1912 by the O.E. Library League. Editor: Henry Newlin Stokes. 1/1, August 30, 1911-1942. 8 pp., 5 1/2 x 7 1/2. unnumbered. Henry Newlin Stokes (1859-1942) was a Theosophist, occultist and humanitarian. In 1905 he began a free lending library of occult material, and for a time the library and this journal functioned as adjuncts of the Oriental Esoteric Center of Washington, the society started by Miss Agnes E. Marsland to propagate the secret Tibetan teachings of "Dr. de Sarak." In 1910, Sarak tried from Paris to exercise control over the Washington Center (and its finances) and the Center was re-organized as the "Oriental Esoteric Society" to exclude him. He promptly retaliated by canceling the charter of the Center and expelling its head, Miss Agnes E. Marsland. She, in turn, in 1912, laid claim to the library that had been affiliated with the Center/Society. This led to another lawsuit, from which Stokes emerged victorious. 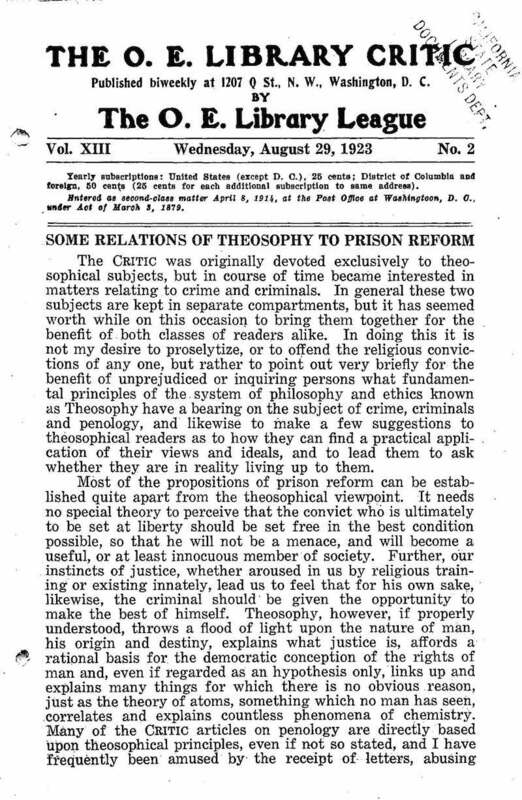 The journal then separated itself from the Society (see the comment in the issue of July 17, 1912) and continued as an outspoken advocate of prisoners' rights and opponent of "Neo-Theosophy" (Theosophy as taught by Annie Besant, Charles Webster Leadbeater, et al., as contrasted with the "original" version expounded by H.P. Blavatsky). The O.E. Library Critic is essential reading for the history of Theosophy because of Stokes's publication of innumerable original documents on the Theosophical Society. A facsimile edition of the entire run of the journal has now been published in by the Theosophical Society of Edmonton, Canada. University of London, Warburg; NYPL, Northern Illinois University; Free Library of Philadelphia.